Weddings have changed tremendously over the past few years, with more and more couples choosing to ditch tradition and get more creative. One thing we love in particular is brides and grooms choosing to include pets in their ceremonies, in a bid to make them more personal. We’ve featured couples that have created monograms of their cats on their wedding stationery, invited their dogs as guests and even a couple who dedicated their whole wedding day to their fur babies. 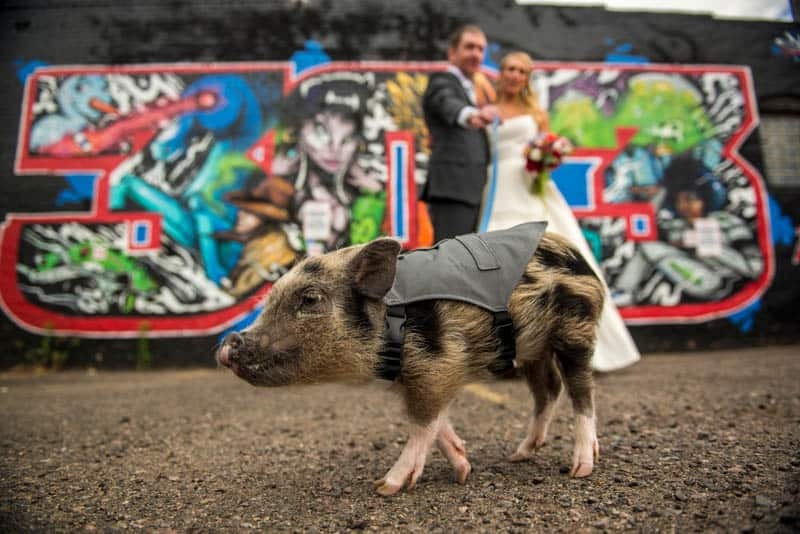 Our reader’s love to see pets in the spotlight, we know because you told us so in our recent survey, so today we are delighted to share another wedding with you featuring a well loved family pet and we know this one is really going make you ‘squeal’ with excitement! “Jefferson is our little man! He’s a two year old (one year at the time) Juliana pig and he’s just the funniest little character. We’re obsessed with him and he has such a spunky personality.” Bride, Olivia explained. “We wanted to share him with all of our friends so spent a lot of time training him to walk the aisle. He did awesome and it made us so happy to see him come trotting towards us. Apparently there were a couple of hawks overhead when he was running down the aisle. Thankfully our friends were quick to scoop him up and keep him safe. Our day wouldn’t have been complete without him.” She told us. Thanks so much for sharing, ladies! We had so much fun with Jefferson, Olivia & Colin! Brilliant! Have seen a few wedding dogs before, but not a wedding pig 😀 So much colour, looks like a great day was had!